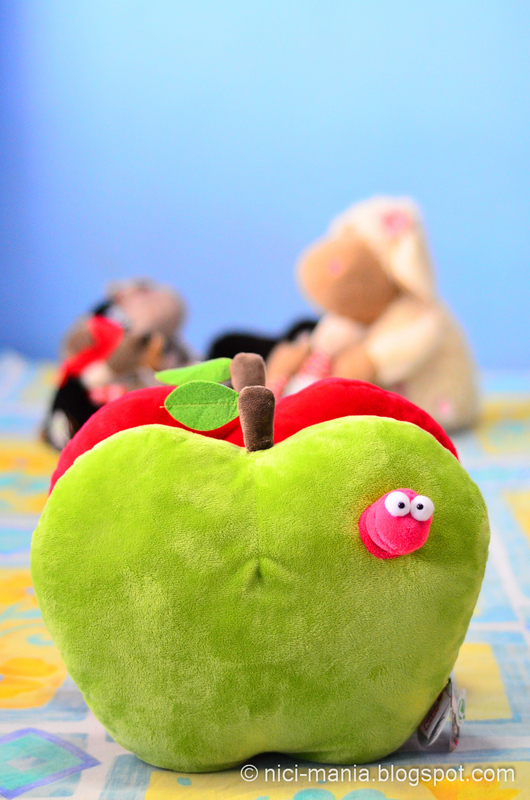 This is the NICI cushion apple, the first NICI cushion of any type we ever bought. This green NICI Cushion apple is from the Jolly Lucy series. The most interesting thing about this green NICI cushion apple is..the worm in the apple can retract and..
extend to its fullest!! This has certainly be the most amusing thing that NICI ever created. 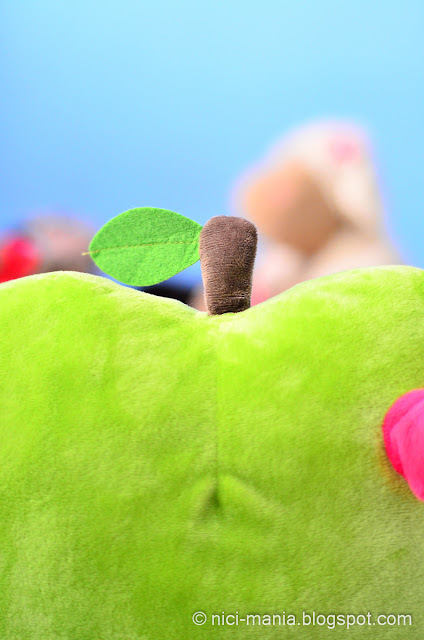 The NICI cushion apple is very detailed in its features, it has the stalk and leaf of an apple. Our green NICI cushion apple worm has noticed something sneaking behind it all the time..its a RED APPLE!! 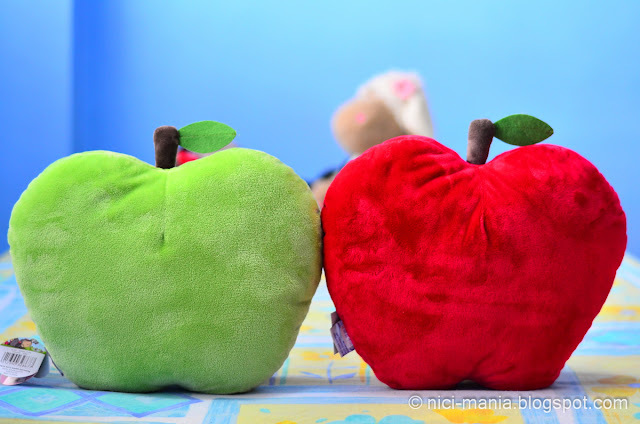 The red and green nici cushion apple looks exactly the same and they are both made of identical soft and smooth material. Both the cushion apple bears the original NICI tag. 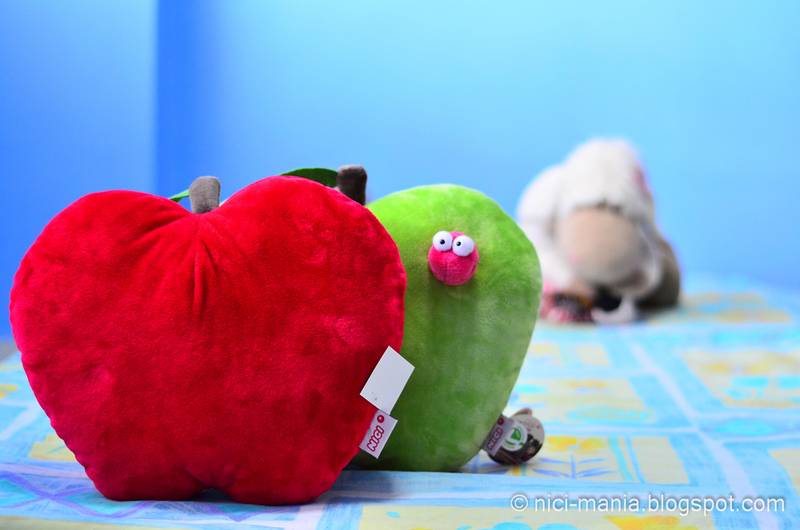 The only difference is the red apple has no worm and it cost 3 times less than the Jolly Lucy green apple cushion. 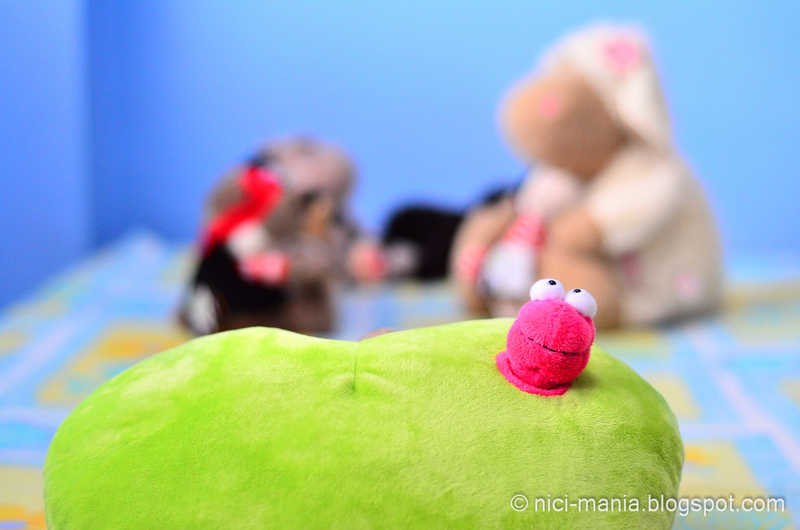 The red cushion apple is not mentioned at all on NICI's website. 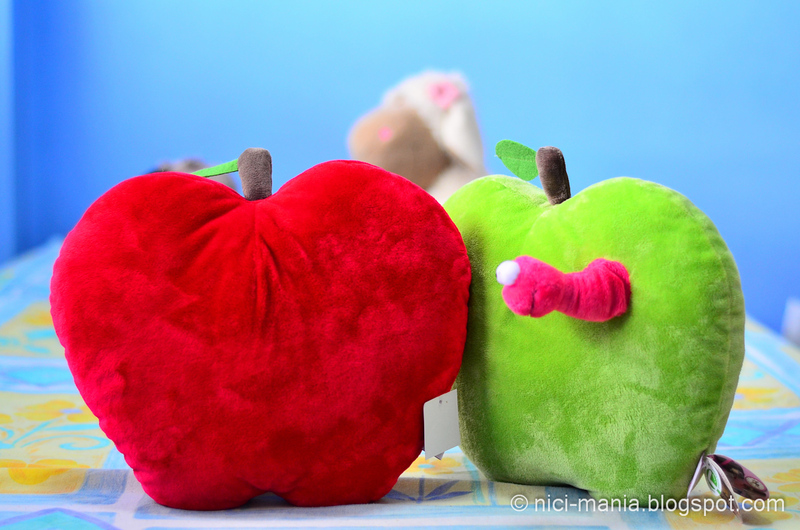 Thus we cannot be sure if it is real or fake but both the NICI cushion apples are very comfortable to hug and cuddle. The red cushion must be false, but still looks nice. 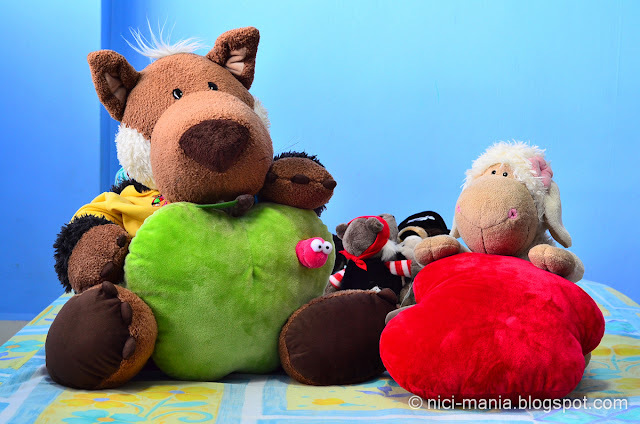 Known of any place in JB that sells NICI plushies? is Pirate Lion and Pirate bear fighting over the pillows? @Minghui: Haha you noticed something was going on behind! :) Jolly Rosa captured pirate gecko and pirate lion and bear was eagerly trying to save gecko from the 'demonic' hands of rosa. i dun blame Rosa.. Gecko is really cute~! @Minghui: Yes please send me a mail ^^ I wanted to mail you first but I can't find your email address anywhere on your blog. Strange that a store would sell real Nici and fake Nici, I hardly believe that, but maybe your country is different that way. 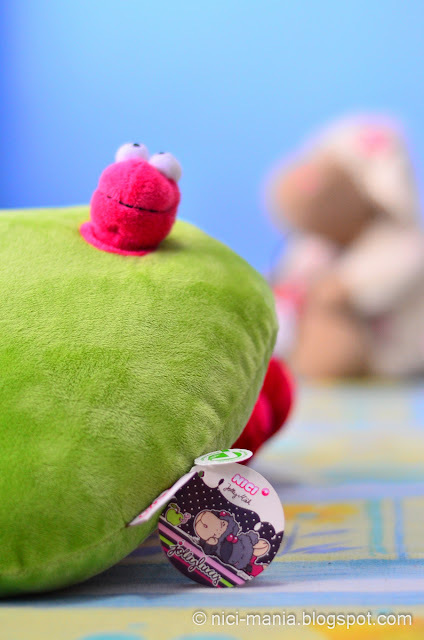 Strange also that Nici Germany (or any other Nici website) hasn't talked about the red cushion. 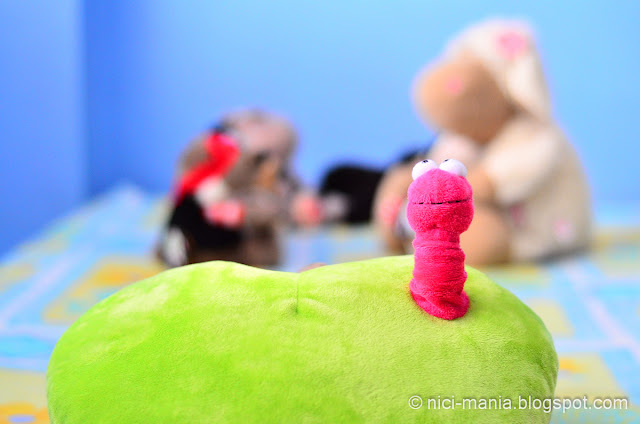 There is something about the worm from the look of his eyes ... LOL. But seems that the worm always "bullied" by Lucy.